I’m not one of those people who balks at buying salad dressing. It has never occurred to me to make ranch dressing because Hidden Valley does such a great job of it. On the other hand, I’ve yet to find a store-bought vinaigrette or Asian sesame dressing I like, so I make my own (or rather, I make Martin Yan’s). It takes all of 5 minutes (maybe 10 if you’re doing it for the first time) and you can tweak it to your taste. 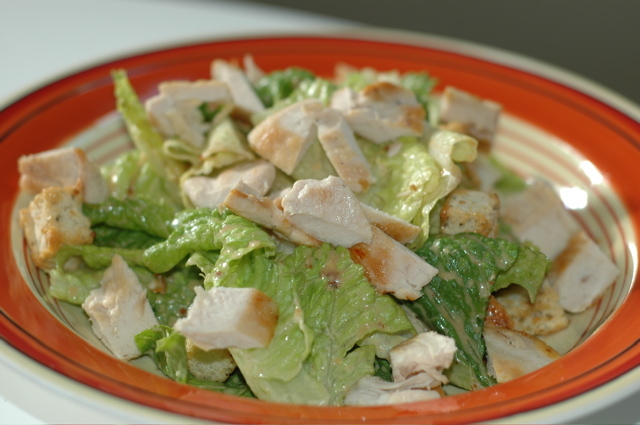 Now I’ve found another dressing I will be making my own: chipotle Caesar dressing from Mr. Personality himself, Bobby Flay. Don’t get me wrong, I always enjoy Mr. Flay’s recipes, he just seems a little...not nice. Anyhoo, I’ve made this dressing so many times in the last 2 weeks because it’s so easy, and I’ve tweaked it to my taste. That is, I added a little more chipotle, reduced the oil by half (not because I’m watching my girly figure, I just like my dressing tangy) and nixed the cheese (I prefer it shaved on top). Still, it is really a delightfully spicy dressing (even though you’d never be able to tell from my boring picture). Throw everything into a food processor or blender, except the oil. With the machine running, slowly drizzle in the oil. Adjust taste with salt and pepper if necessary. Makes a about a cup of dressing. Leftover dressing can be stored in an airtight container for up to 3 days (maybe more, but I’ve never had to keep it for longer).